Thank you for joining us for the third installment of Beer Tuesday, where I take some time throughout the month of April to champion a brewery in Kansas City who brings a little something to the area. 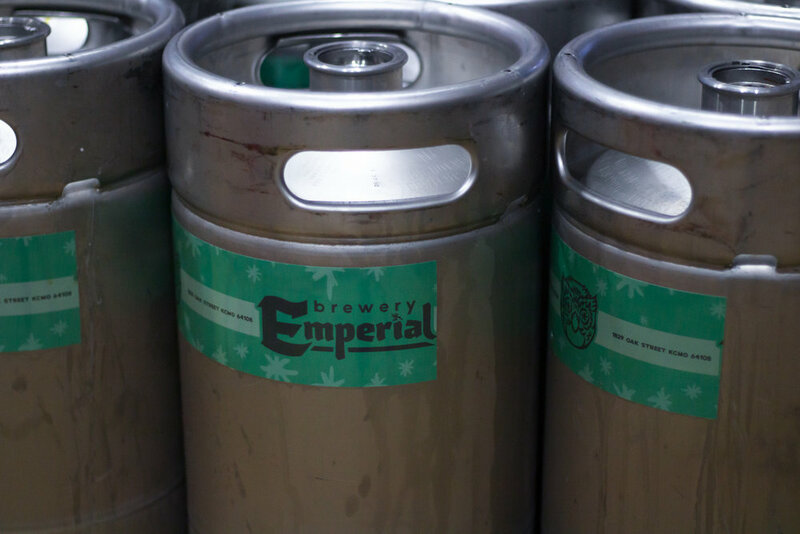 This week, we raise a beer to the team at Brewery Emperial in the Crossroads. Brewery Emperial opened in late 2016, but if you ask master brewer, Keith Thompson, its origin story starts in 1994. Thompson was studying biology at KU and working in the restaurant industry when he and his friends decided to move to Charleston to open the first brewery in town. They arrived on the scene to find the first brewery had already opened and made their trek back home to Lawrence, KS. After that, Thompson spent a fair amount of time (between Free State Brewing, 75th St. Brewery, and McCoy’s Public House) in the brewing industry before opening Brewery Emperial twenty-five years later with friends and family. With Thompson’s brewing experience alone, Brewery Emperial could have just been a stand alone brewery– but the founders (Keith & Julie Thompson, Ted Habiger, and Rich Kasyjanski) saw the chance to make it something more. “We looked around in the Crossroads and other parts of Kansas City for the right place to build a brewery, restaurant, and a large outdoor beer garden. I believe great food, great beer, and great personalities bring people together,” says Thompson. And there is no doubt this brewery/restaurant lovechild perfectly represents those beliefs. While I could go on forever about the food at Brewery Emperial (inside out grilled cheese ftw), we’re here for the beer. Between Thompson and head brewer, Sterling Holman, the two have a combined 45+ years of experience in brewing, making it easy to see why the beers are so good. As Holman puts it, he and Keith have “gotten their bad batches out of the way” before making it to Brewery Emperial. They instinctively know what will happen with each brew recipe, and that allows them to experiment with what they like and want to do more of. But you won’t find anything crazy or gimmicky in this space. The beers on draft all boast practical names that let you know exactly what you’re ordering. For example, the second IPA on the list is named “The Other IPA.” Biscuit, the most popular beer on the menu, features a biscuit malt in the recipe and was easy for the brewers to name. Holman says it was picked up as a nickname for the brew while they developed the recipe and it eventually stuck when they released it to the public. “Plus, I think people have fun saying the name when they order,” Holman admits. The future of Brewery Emperial definitely points towards more chances to drink beer and enjoy yourself. Thompson says they’re building a solar canopy to cover part of the beer garden during those hot summer days, while also generating electricity and reducing their carbon footprint. Sounds like a triple win for Brewery Emperial fans. You can visit Brewery Emperial rain or shine at 1829 Oak St. in the Crossroads.